First Sentence: "You won't be late?" Aldous Huxley is most famous nowadays for his novel Brave New World, which I read in high school and will be rereading in several years because it's #5 on The List. Certainly dystopia is having a moment right now and for the past decade or so, but the novel at hand, Point Counter Point, is less popular for a few other reasons. 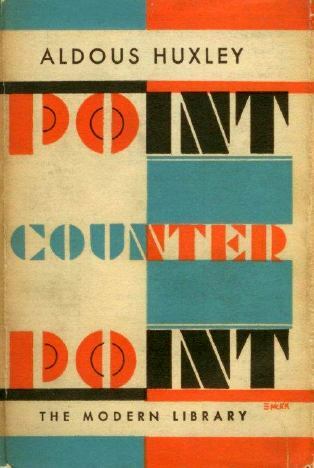 Point Counter Point is concerned with human passions versus reason and the intellect. To illustrate this, Huxley throws situational dice featuring an enormous cast of characters in 1920s London, some of whom are based on real people who were running around at the time. Walter Bidlake is dealing with his boring, silly mistress Marjorie and also pursuing a woman named Lucy Tantamount. Philip and Elinor Quarles are generally trying to navigate the fact that their marriage is in trouble because Philip struggles to express his feelings. Lucy's father's lab assistant, Illidge, is bitter about how everyone he interacts with is rich. There really isn't an overarching plot, just this overarching question of what happens when passion is pitted against reason. Those incredible Diabelli variations, for example. The whole range of thought and feeling, yet all in organic relation to a ridiculous little waltz tune. Get this into a novel. How? The abrupt transitions are easy enough. All you need is a sufficiency of characters and parallel, contrapuntal plots. While Jones is murdering a wife, Smith is wheeling the perambulator in the park. You alternate the themes. More interesting, the modulations and variations are also more difficult. He shows several people falling in love, or dying, or praying in different ways—dissimilars solving the same problem. Or, vice versa, similar people confronted with dissimilar problems. In this way you can modulate through all the aspects of your theme, you can write variations in any number of different moods. Another way: The novelist can assume the god-like create privilege and simply elect to consider the events of the story in their various aspects—emotional, scientific, economic, religious, metaphysical, etc. He will modulate from one to the other—as, from the aesthetic to the physico-chemical aspect of things, from the religious to the physiological or financial. But perhaps this is a too tyrannical imposition of the author's will. Some people would think so. Put a novelist into the novel. He justifies aesthetic generalizations, which may be interesting—at least to me. He also justifies experiment. Specimens of his work may illustrate other possible or impossible ways of telling a story. And if you have him telling parts of the same story as you are, you can make a variation on the theme. But why draw the line at one novelist inside your novel? Why not a second inside his? And a third inside the novel of the second? 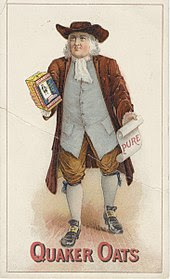 And so on to infinity, like those advertisements of Quaker Oats where there's a Quaker holding a box of oats, on which is a picture of another Quaker holding another box of oats, on which etc., etc. At about the tenth remove you might have a novelist telling your story in algebraic symbols or in terms of variations in blood pressure, pulse, secretion of ductless glands, and reaction times. The novel is saved from being a boring set of dialogues like Walden Two by a few factors: Huxley is a much better writer than Skinner, the characters are all distinct people in distinct situations, and finally Huxley's mind-boggling prescience. The book is more quotable than anything else I've read in a long time, except maybe Julius Caesar. I don't know enough about the 1920s London lit scene to have picked up on who any of the characters were modelled after besides being convinced that Philip Quarles is Huxley's portrait of himself (and not a very flattering one). My favourite part of the book was the chapter featuring the courtship of the characters Mark and Mary Rampion, a poor man who married a rich girl and eventually made a living through art. I was surprised to find out that Mark Rampion is apparently modelled after D. H. Lawrence. Maybe I shouldn't be quite so surprised, though, since I at least appreciated the concept of The Rainbow, if not its execution. Would you believe that I'm struggling with a rating yet again? I almost regret the conclusion I drew when reviewing Light in August about not adding a 2.5 rating. Books tend to end up getting 2/3 ratings when I find them a chore to read, but just because something's hard doesn't mean it's not worthwhile for other reasons. I guess what I'm trying to say is that I hope that ultimately you'll decide to read some of these books not solely based on my ratings, but on my reviews as well. In this case, yep, Point Counter Point was a chore and I never really wanted to pick it back up again. It's dense for obvious reasons, and I can't enthusiastically recommend it to just anyone, but I think there's a lot of interesting stuff in this novel that would reward a close reading by an interested party. Polly's voice dropped again to a stage whisper. She liked to make everything sound exciting—as exciting as she felt everything to be. She was only twenty. "...Because... yes, because I really like hating and being bored." He liked it. The rain fell and fell; the mushrooms sprouted in his very heart and he deliberately cultivated them. He could have gone to see his friends; but he preferred to be bored and alone. Her stockings were the colour of sunburnt flesh. Brought up in an epoch when ladies apparently rolled along on wheels, Mr. Quarles was peculiarly susceptible to calves, found modern fashions a treat, and could never quite get over the belief that the young women who adopted them had deliberately made themselves indecent for his benefit and because they wanted him to become their lover. But the very possession of a body is a cynical comment on the soul and all its ways. It is a piece of cynicism, however, which the soul must accept, whether it likes it or no. Elinor duly went to bed at eleven and came down to meals—if only that she might have strength to endure yet more unhappiness. To suffer was the only thing she could do; she wanted to suffer as much and intensely as she could.